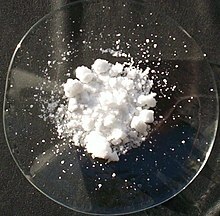 Potassium carbonate, also known as potash or pearl ash, is a chemical compound. It is made of potassium and carbonate ions. Its chemical formula is K2CO3. Potassium carbonate is a white solid. It dissolves in water. It is similar to sodium carbonate. It reacts with acids to make carbon dioxide and a potassium salt. It does not dissolve in alcohol. It is basic. It is a mild drying agent. It is made by the reaction of carbon dioxide with potassium hydroxide. It is used to soften water (remove some of the ions from water) and make soap. It is used to put out fires. It can be used as an electrolyte to electrolyze water. This page was last changed on 27 July 2013, at 12:54.